With the first key you have to clear the most of the two lines of the locked blocks, after having smashed the wires around them. Practically you have to clear all the locked blocks before you pass the ledges and see the bottom of the screen. After this point things are getting quite simple. 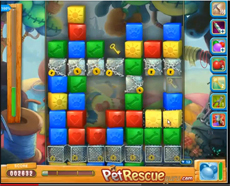 Clear the blocks to pass the level. You can be helped in this by the balloon booster it will be activated once again. If stuck on Level 513 you should spend a moment to watch our walkthrough video!